In the middle of the transformation. Photos by Kat St. John. I know. Right? She does hair, makeup and also is a visionary behind the lens. Over time, the cut becomes dated. So, they fall out of the heavy rotation. But they are still functional, they've held up well and, "they work." However, they don't look fresh and they certainly don't make the wearer feel like she's killing it at life. This, My Dear Reader, is a great question. I'm including photos from my work with my incredibly gracious client, Julie, and my favorite tailor. The answer may surprise you. First, you must ask yourself some questions. Time to inspect the fabric in the natural light. 1. Does the fabric feel fresh and modern? Are these pilling? Are we looking at a faded brown pair of trousers that won't be amazing regardless of their shape? If the fabric is not at the level you are, they need to go. Donating them is the best course of action. 2. Is the weight of the fabric useful this time of year (or in the coming months)? 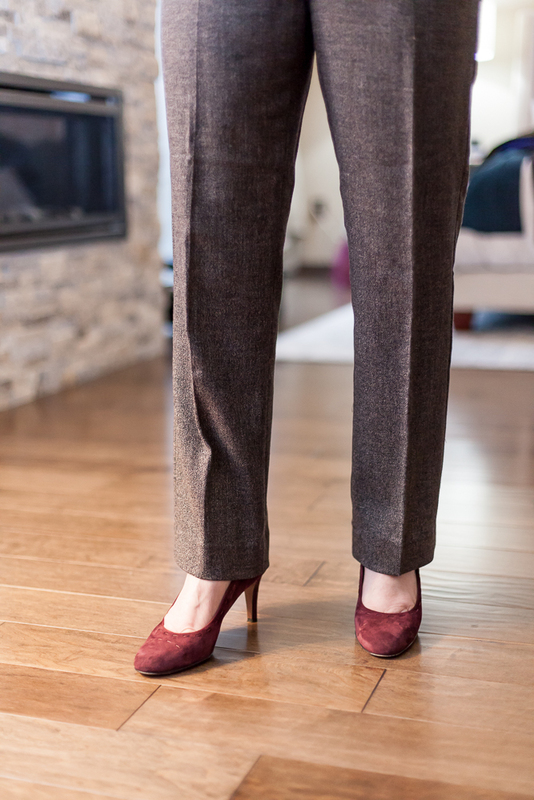 Wool pants, for instance, can be glorious in cold weather. As we head into spring, they would normally be stored. So, there's really no reason to invest in them right now. If you love the fabric, but not the cut. Put them away to revisit at the end of the summer. Now, we're looking at pants that are made from nice fabric but just happen to be in an outdated style. Here we go. This makes me think of my grandmother. It certainly has more pins in it than my pin cushion which confirms it belongs to a professional. 1. Be sure the style is truly outdated. I've worked with a number of clients who think that wide leg pants are no longer current. Actually, wide leg pants are a thing, folks. In fact, right now we are seeing more leglines than ever. So, just triple check your silhouette to be sure that your pants actually are out of date. 2. Get ready for the tailor. Yes, the tailor. I know magazines always say to find a great tailor. It seems like a first world problem situation. But, I'm telling you, a tailor can accomplish so much, if he/she has the skills. And revamping your old workpants is an ideal task. There's SO much that can be done.Start by identifying what cuts are flattering for your body type. I can help with that. And, the upcoming Poplin books will give you even more information. Make sure you are on the email list to be in the know when these launch. Pinned up to see where we are going. See how easy it is to pop your shoes on with a shorter length? 1. Make them ankle length pants. Ankle length pants are all the rage right now. Yes, you can wear them throughout the year. Try them with ankle boots, heels, flats, platforms, wedges, sneakers, the list goes on. If a pant feels wide, for instance, simply turning it into a culotte (cropped wide leg pant) will be transformative. No longer will you struggle with the shoe pairing and you can wear these beauties ASAP. Notice the leg to your left is the original full length, wide style. The leg on your right is the pinned version. It's slimmer and shorter. Another pair after tailoring. We updated several pairs that weren't in use. It's likely that you trousers are wider than you'd like them to be, even though they aren't actually wide leg pants. Consider transforming them into a cigarette pant. Your looking for a slim silhouette that isn't quite skinny, but shows your shape. I love these that are also ankle length or have a slit in the side at the ankle. The before shot showing the seat and rise are ready to be adjusted. After! This looks so good. Choose how snug you'd like the seat to be based on your comfort level and current styles. 3. Take in the seat. I can't tell you what a revelation it is for clients to see what they can look like when the seat of their pants isn't sagging. Yes, I know you want to be sure everything is age appropriate. I agree. But, there's no need to hide your shape simply because the years are going by. Work with your body and be sure there isn't extra fabric on your backside. It's highly likely that your pants have stretched in this area of the years, especially as so many work pants have stretch. The tailor can take in the rise by eliminating extra fabric from below the waistband and/or the seem in between the legs. It's possible that you may need the rise of your pants to be different now than you did when you purchased them. Have you ever noticed that some pants or jeans have a higher rise in the back than in the front? That's to accommodate a round backside. If that sounds like it would benefit you, ask your tailor to make the adjustment. Or, if you have a flatter bum, ask for a lower rise in the back than in the front. If you have pants that are higher rise than you now prefer, ask for the rise to be taken in all around. Remember, that a higher rise pant will minimize your stomach, so pay attention to your needs and avoid adjusting the rise just because. 5. Make them a kick crop. If you like a slim or skinny pant but you know that you need to balance out your broader shoulders or bust with a wider pant, you may feel a bit stuck. After all, your work pants are most likely black, grey, dark brown or another dark neutral. If you have an Inverted Triangle shaped figure (shoulders are wider than hips) a slim black pant will keep your shape off balance. Instead, go for a kick crop. Essentially, these are flare cropped pants. This extra "kick" at the bottom balances out your shape. Whether you are trying to save cash by keeping your pieces longer, you are trying to reduce your footprint by buying less or you just can't imagine parting with your favorite pieces, this window into some tailoring solutions is intended to get you where you are going. Like it? There's more to come with a scheduled Poplin book about tailoring. So much on the horizon! I'm dying to know if this is helpful to you. Have you tried these major transformations on your work pants before? How did it go? Or are you looking to do this in the future? Please share. And, remember, you can find product suggestions by body type or style on Poplin's Pinterest boards. Enjoy! P.P.S. We've got a giveaway with Universal Standard coming up. Make sure you are on the email list to be entered to win.